Jasmine Restaurant, conveniently located off of Concord Pike, in North Wilmington in the Concord Square shopping center, has a wonderful reputation as a great Sushi Restaurant. The freshness of their seafood, combination of flavors, and presentation make this undeniable. The ambiance of the restaurant is as tasteful as the food. The contrast of soft dim lighting, with a unique color changing bar and silver beaded curtains makes you feel as though you are in a chic metropolitan bar. As for the food, the menu is a lot larger than you would imagine ranging from traditional wok dishes like Pad Thai, to lo mein and, of course, a wide variety of exotic sushi options such as Spider Rolls and Green Dragon Rolls. If you are in the mood to venture out and trying something new, I definitely recommend the volcano roll. The volcano roll consists of spicy tuna wrapped in seaweed and sweet rice, then glazed with a zesty mayonnaise sauce. The combination of sweet and spicy will satisfy all your taste buds. 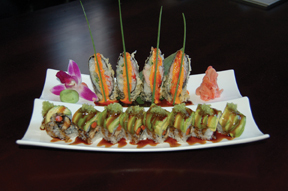 If are not one of us who craves sushi, Jasmine offers plenty of other dishes you will be intrigued by. Their appetizers are meals themselves. They offer everything from spring rolls, crab wontons, to chicken satays. Their refreshing house salad with ginger dressing makes other salads seem boring. Now that we are getting into the heart of winter, most people are spending less time traveling to the Delaware Beaches. But, if you do find yourself in Rehoboth, make sure you stop by Saketumi, Jasmine’s sister restaurant located off Route One. With an amazing happy hour every day from 4-6, you can’t find a better deal. 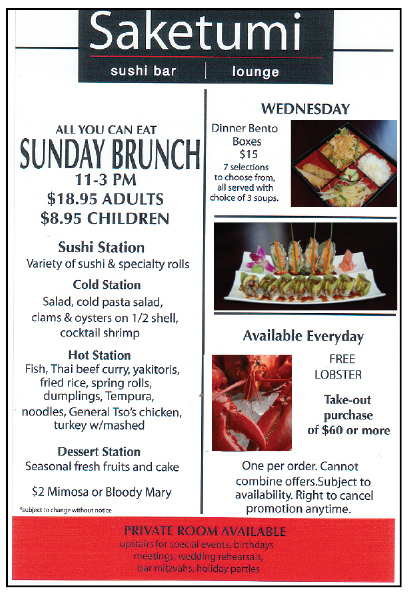 Saketumi also has an impressive Sunday brunch with selections that promise a brunch like you’ve never had before. With all of the holiday & wedding planning that goes on during this time of year, keep both Jasmine & Saketumi in mind for your next event. 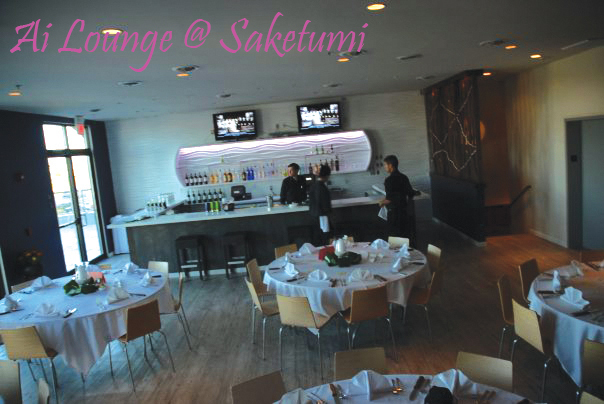 Saketumi even has a new upstairs lounge area that offers a dramatic, modern appeal with rich textures & color contrasts. This, of course, is only topped off by the amazing food selections at either location. The Spicy Seafood Noodles are a must try, with flat rice noodles, shrimp, scallops, squid and basil in Thai spicy sauce. The flavor combination in this dish will make you wake up the next morning craving your leftovers from the generous portions. The Thai Lemongrass Soup is another irresistible one for me. Although all of their soups are outstanding, this one has just the right amount of spice to make me feel cozy. It’s the kind of soup that you need when your under the weather. So, whether you are looking for a great sushi roll or Asian cuisine; and whether you are North or South in the state this Winter, Jasmine & Saketumi offer you more than just a delicious meal – they offer a truly unique experience you won’t want to miss.